Earlier this week we introduced binary options, a type of exotic derivative that is embedded in some retail structured products such as dual directionals. Today we're going to go over barrier options, which are another exotic option contract that happens to be embedded in one of the most popular types of structured products: reverse convertibles. Like vanilla options, barrier options have a payoff that compares the final asset price to the strike price of the option. 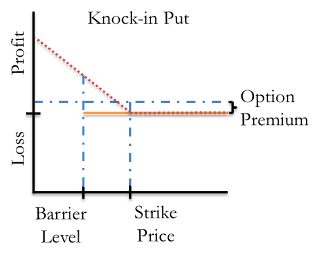 In addition, the payoff of barrier options depends on the value of the underlying asset relative to a barrier level throughout the term of the contract. 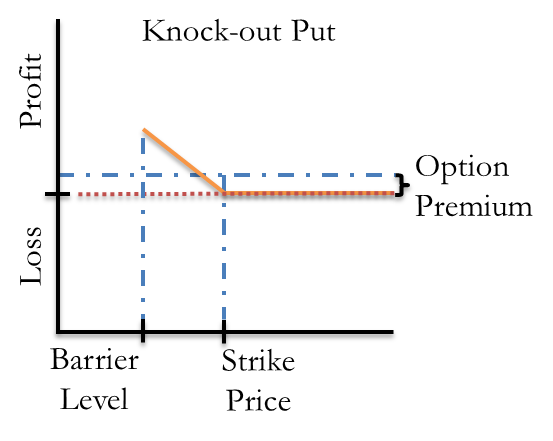 If the asset price breaches a prespecified barrier, a trigger event occurs and the option is either knocked-in -- resulting in the option becoming effective -- or knocked-out -- resulting in the option becoming ineffective. Recall that binary options pay out if an asset crosses a threshold level. You can think of barrier options as essentially binary options, but instead of delivering an asset or a fixed amount of cash, they deliver a vanilla option contract with a given strike price. That would be a knock-in barrier option; a knock-out option would be like the other side of that trade, which has to give up a vanilla option if the barrier level is breached. Barrier options also come in call and put varieties, and can be American, European, or any other exercise style. Let's first look at a knock-in call option. In this case, let's assume that the barrier is above the strike (this is sometimes called an up-and-in call option). If the underlying asset appreciates above the barrier level during the term of the contract, then the option pays off like a vanilla call option (positive payout if the underlying price is greater than the strike at expiration). On the other hand, if the asset does not appreciate above the barrier price, then the option expires worthless. The following figure illustrates this payoff. 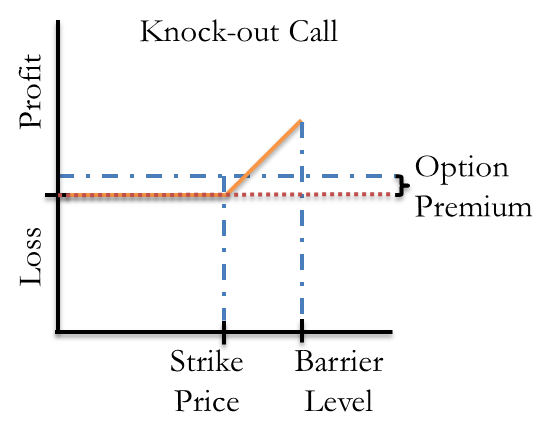 The red dotted line represents the realized profit or loss at maturity if the barrier is breached during the term of the contract while the solid orange line represents the profit and loss realized at maturity if the barrier is not breached. The premium for these options is always lower than those for vanilla options with the same strike price and expiration because the payoff at maturity is less than a vanilla option if the barrier is not breached. Similarly, a knock-in put option essentially becomes a vanilla put option if the barrier level is breached. 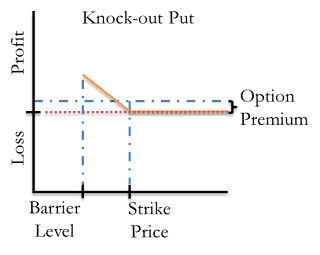 The following figure illustrates a down-and-in put option in which the barrier level is below the strike price. Let's now turn to knock-out options. 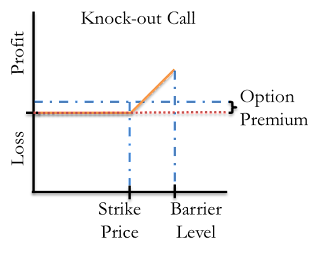 A knock-out call option functions like an ordinary call option unless the barrier is breached during the term of the contract; otherwise the option expires worthless. 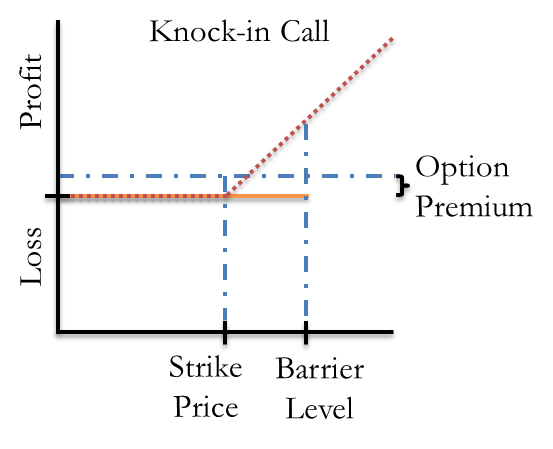 The following figure illustrates this payoff with barrier level above the strike price (referred to as an up-and-out call option). 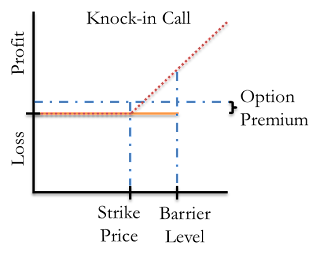 Notice that the once the barrier is breached, there is no payoff at maturity and the holder of the barrier option realizes a loss independent of the underlying asset price at the contract's expiration. Finally, a knock-out put option functions like an ordinary put option unless the barrier level is breached during the term of the contract. 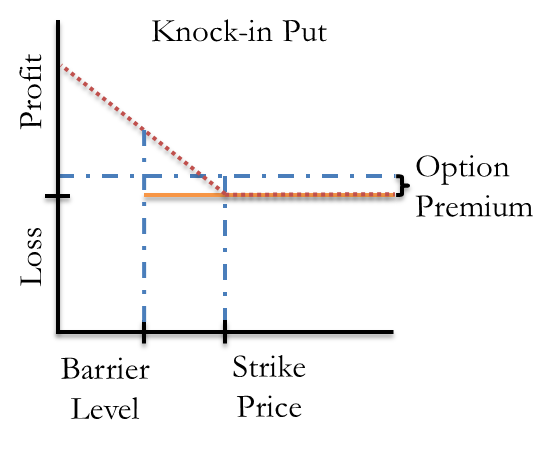 The following figure illustrates this payoff with barrier level below the strike price (referred to as an down-and-out put option). Interestingly, there is a parity relationship between barrier options and vanilla options. Think about an investor who buys two barrier call options, identical in every way except that one is a knock-in call option and the other is a knock-out call option. The investor pays a higher total premium since the premium for each barrier option must be funded. If the barrier is breached during the term of the contracts, the knock-out option expires worthless and the knock-in option converts to a vanilla call option. If the barrier level is not breached during before expiration, the knock-in option expires worthless and the knock-out option pays off like a vanilla call option. As a result, buying these two barrier options is the same as buying one vanilla call option. You can find barrier options --particularly down-and-in puts -- embedded in reverse convertibles. 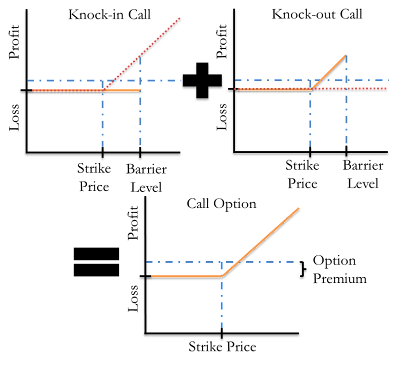 These options give reverse convertibles their characteristic downward slope in the event of a barrier level being breached (the slope is downward because reverse convertibles embed a short down-and-in put). Barrier options also appear in a variety of other structured products, and can add an enormous amount of additional complexity to already complicated option positions. I don't think this definition gonna hold valid. If the barrier level is breached during the term of the contract, then the option is worthless. 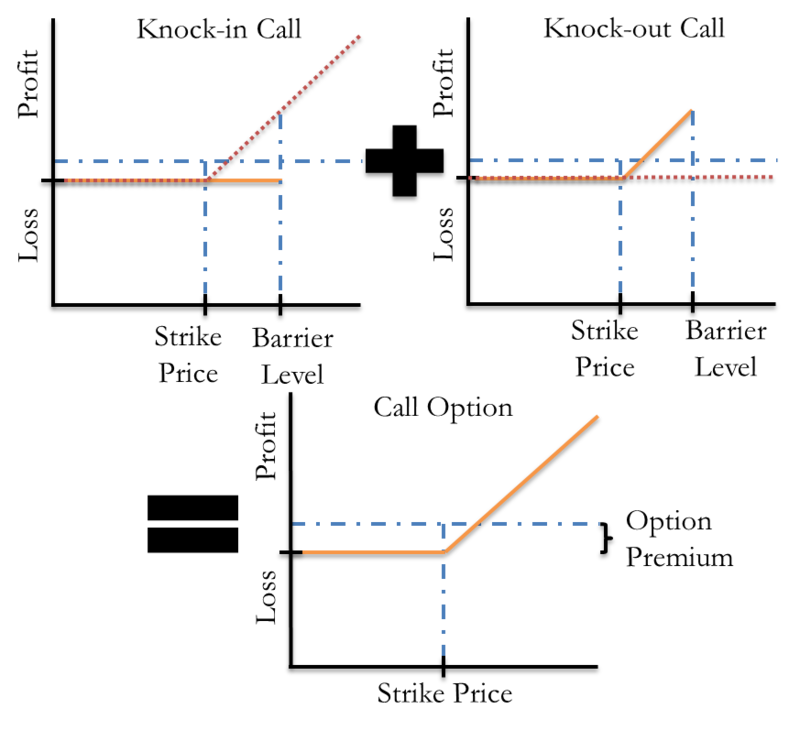 If the barrier is not breached during the term of the contract, then the option functions like a put option. The same applies to knock put call option.